On my way home from the license bureau I stopped at Half Priced Books to flip through old comics, an activity I find therapeutic. I found 8 old Warlord comics I didn't have! After entering them into the database I did a run on my comic collection statistics. Warlord is now the title I have the most issues of at 86 (of 133). Nearly 100% of those are purchases from Halfpriced Books or other cheap bins over the last couple of years. Also and a good deal of tracking which issues I already have has helped. This month DC Comics re-launched the title! They attempted to launch a reboot of the series a few years ago and that was a complete fail. This new relaunch continues the original comic and is written by the same guy who created the book. Warlord's setting is heavily inspired and pays heavy homage to Edgar Rice Burrough's Pellucidar series which is set in the Hollow Earth. Warlord has more fantasy and science fiction elements than that of Pellucidar. The original comic ran from 1976 till the mid '80s. In the savage world of Skartaris, life is a constant struggle for survival. Here, beneath an unblinking orb of eternal sunlight, one simple law prevails: If you let down your guard for an instant you will soon be very dead. One man's trash is another's treasure. It's amazing what you can find in those cheap bins. This is still one of my favorite comics. 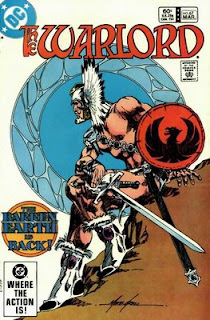 Mike Grell and his wife Sharon wrote awesome stories and most of the art was first rate. Some of the later stories (from Dan Jurgen, I think) left me bleh and they even had time travel in them! I hope we see The Warlord and Skartaris make an appearance in the New 52. There's so many possibilities. I could see Travis Warlord appear in a future issue of Aquaman or Aquaman and The Others. Justice League Dark sounds like a good fit as well for The Warlord. Jennifer Morgan would make a great member of the JLD. There's also Constantine and Swamp Thing.